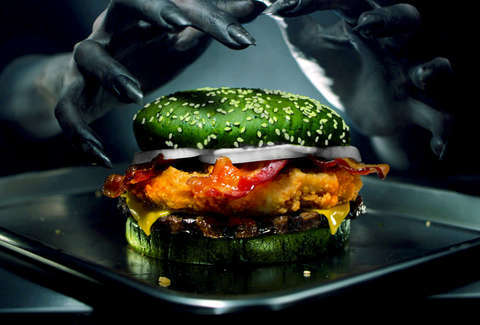 Burger King is super into morphing its food into fun colors in honor of Halloween. It previously made a Whopper on a black bun, and this year it released the jet black slush drink called the Frozen Fanta Scary Black Cherry. You can now add the Nightmare King to that list. The meat pile layers a quarter-pound of beef under a crispy chicken fillet, bacon, cheese, mayo, and onions. All of it is loaded onto a glazed sesame seed bun that is nuclear green. The Nightmare King has atypical coloring in common with those first two items, but it's a mystery whether it will share another notable trait with them. Both the black bunned-Whopper and the black cherry drink were met with widespread reports of the food turning people's poop strange colors. Burger King says the Nightmare King's name is hard won. It was made in partnership with the Paramount Trials and Florida Sleep & Neuro Diagnostic Services, Inc. and Goldforest Inc., according to the chain's press release. All these groups helped BK conduct a 10-night study with 100 participants to prove that it actually causes nightmares. Each of the participants ate the Nightmare King before crashing for the night, and BK reports that eating the burger increased the instances of nightmares by 3.5 times. Burger King says that's real. Though, it feels reasonable to greet the figure with a healthy amount of skepticism. On the other hand, putting down a giant pile of meat before falling asleep seems like it could certainly cause... disturbances. Whether you're into meat piles, want to see if your poop changes colors (don't act like the number of people in this group is zero), or you're genuinely curious if you can induce a nightmare, the Nightmare King is available for a limited time starting on October 22.